A perfect depiction of sibling love. A word or five per page, perfect for even the most impatient of readers/listeners. From questioning to waiting, anticipating to "Hugging, holding. Love unfolding." 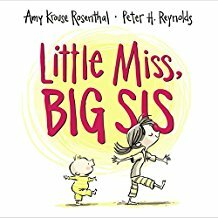 Little Miss is now the Big Sis. "Do not despair—I’ll help care!" she doth declare. And she does. We follow along, reading the story, admiring the illustrations that bring such richness to the words. One expects no less from this author-illustrator duo. Sparse writing, but clearly defined nonetheless is the character of the older sibling. An excellent praise poem. Keep it, gift it to families expecting the second child. Enjoy it.